Naked Truth About Barefoot Running! 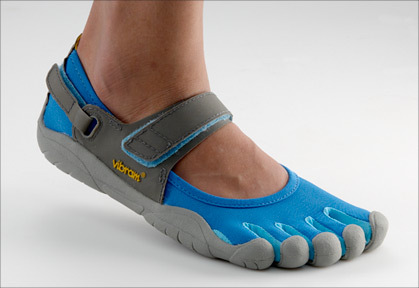 Ditch Those Shoes… Start Running Barefoot! Barefoot running isn’t a new trend! History has enough evidence of barefoot running or running in moccasins (thin-soled shoes). Some parts of the world such as Kenya and Mexico still practice barefoot running today. Historians divulge that ancient Greek runners ran barefoot. The legendary Pheidippides, the first marathon runner, ran from Athens to Sparta, covering thirty six hours, all in bones, muscles and flesh, but no lace. Modern barefoot running was recognized in 1960 when Abebe Bikila won the Olympic marathon, running barefoot, because the Olympics shoe supplier – Adidas – ran out of Abebe’s size. The runner was uncomfortable in a smaller size and ditched it to win the race. The pros and cons of barefoot running is a contentious issue even today among scientists and medical experts. Many still agree to the pros of running barefoot. 1970s saw the burgeoning of jogging in western countries that led to the making and marketing of running shoes. Since then, running shoes have been blamed for increased risks of running injuries. However, much research is yet to be done to determine the long term benefits of barefoot running. A Podiatrist should be consulted before taking running and training programmes seriously. Diabetics are advised not to run barefoot to avoid risks of injury. -Real accounts of barefoot runners, however, show that barefoot running does help. While some felt that their knees hurt less, others exclaimed that they felt the difference immediately – the body seemed more aligned and it felt as though you were running from the core. -The theory is simple and not about what you wear or not. It is about how your feet strike the ground. 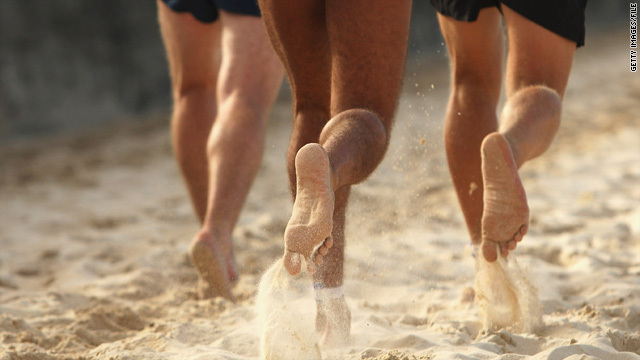 Barefoot running, experts believe, impacts farther forward of the foot rather than the heel. A 2010 study published in Nature showed that barefoot runners who landed on the balls of their feet experienced less collision force than those who ran with shoes on and landed on their heels. The force on the heel was reported to be up to three times the runner’s body weight. So imagine the impact on the heels if you run fast. -Barefoot running also allows you to assess the landing. You are gentler with your feet because you are in a closer relationship to the ground. If you don’t want to go completely bare, keeping in mind the cuts and scratches, try moccasins or thin sandals to protect the feet from dirt, water and injury. Thin-soled canvas shoes were worn before the modern running shoe was born. Modern shoe makers are taking to the increasing demand very seriously and are coming up with shoes especially designed to give the barefoot experience with features such as maximum flexibility, protection and natural walking ability. Barefoot running is a choice and its long term benefits are still being researched extensively. Different people have different running styles – various factors such as size, body weight, frame etc., determine its benefits for health. -Consult your doctor for feet problems before going barefoot and get a thorough check up done. -Make a slow start, because your leg and foot muscles need to be conditioned to run barefoot – start with jogging and walking in intervals; walk for nine minutes and run for one minute covering long distance; don’t forget that the skin also needs to toughen up, to run barefoot. -Think twice, as you could land up with minor bruises if you step on pebbles or glass; wear barefoot running shoes for protection against cuts and bruises. -You should know when to stop; for example, stop if you experience numbness in the feet.